Wi-Fi has been rising as an option to get internet access. Some city now provides citywide Wi-Fi and apartment complexes have free Wi-Fi access for resident. You may also choose to pay for commercial Wi-Fi services. Stealing Wi-Fi, however, is not recommended. Many Wi-Fi leecher has been caught and face jail terms. Wi-Fi internet services are not fast and have a lower reliability. User of Wi-Fi internet should consider a dualwan router and subscribe to a landline internet as backup. This will reduce your internet downtime. On the other hand, Wi-Fi Internet is also a great option for person who already has a landline and wants more internet uptime. While Wi-Fi may have a lower reliability than landline, but it has a lower cost per month. Your network will see increase in bandwidth, and you only need the Wi-Fi as a backup when your landline is down. Or you can load balance your traffic through the Wi-Fi. Wi-Fi reliability depends largely on the signal strength. A high-power Wi-Fi Modem will be able eliminate dropping connections due to low signal strength. 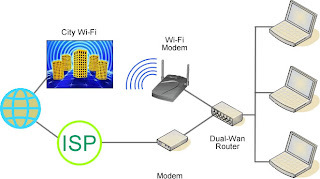 PePWave manufacture a High-Power directional Wi-Fi Modem called Surf-DX and you can connects to a distant access point. Pair with a good dualwan router such as PePLink and add to your existing landline internet. This is the ultimate consumer dual wan solution for an always on internet. Firefox Extension DownThemAll is an advanced download manager free of charges. Most important of all, it accelerates download speed by making multiple connections to a web or FTP server simultaneously. Sounds familiar in the multi-WAN world? Yes! To take advantage of all available bandwidths of all Internet links, you have to have multiple connections (or sessions), more so for single user environments. Anyway, if you're using Firefox, get DownThemAll to easily enjoy the best of what a multi-WAN router can offer - combining all bandwidths from multiple Internet links! Remember DownThemAll is a free extension available for Firefox (Windows/OSX/Linux). 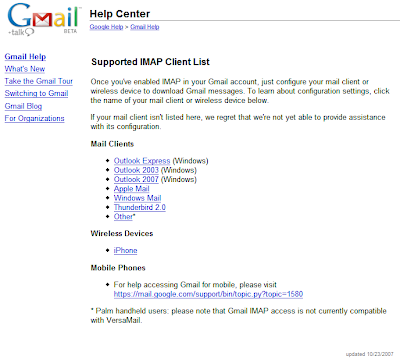 Gmail IMAP support is rolling out! 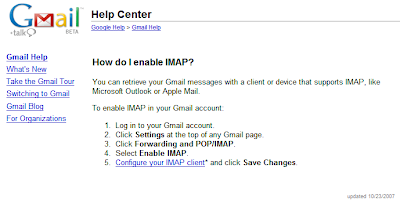 There are early signs that Gmail is rolling out IMAP support in the next few days or hours. The online help section has all the IMAP support materials posted already! What's even more interesting is the support of iPhone!!! Wow! A few weeks ago, we demonstrate the Google Presentation here in Dual-WAN.com. Web Application is going to be the future of software. The trend is clear. Web Application has many advantages over traditional software. It requires no installation. It only has to be compatible with the browser, instead of the whole computer and therefore causing less bug running across platform. It can be update by the administrator easily. Instead of issuing patch or service pack, any major bug or improvement associate with a web application can be updated quickly, depending on the size of web application. The best part of internet application is the accessibility of the same interface and documents anywhere in the world, as long as you are connected to the internet. Web Application has only one drawback, you have to be online. The Google Gear is a great tool to make web application work offline, but this is for people who need to access this when they are traveling around. Google Gears cannot help much when there is an internet outrage. Many small business, medium business are now depending solely on web application, along with high VoIP usage. With such a high dependency on the internet, a stable internet connection is very very essential. That’s where the dualwan or multiwan router comes in. A business should not be stopped just because the internet is down.